Recipes, books, and nutritious musings. There was snow on the ground when I got up this morning. So, I realize I’m jumping the gun with all these spring ingredients, but it still feels like they are a long way off from the farmer’s market and I can’t wait any longer. This salad looks fussy, but it is far from it. It comes together quickly, and is infinitely adaptable. The dressing is assertive (and certainly not for the caper haters), but deliciously bright. Use whatever vegetables you have around, cooked or raw. Chicken or fish could be added (or omit the egg for a vegan meal). If you have any fancy or flavored salt around, this is a great time to use it. I had some lemon salt I made (so easy! ), but a big flake or sea salt would shine here. I love the look and process of eating a composed salad, but you could certainly toss it too. Is that enough options? Get to salad making! Salad inspired by Alana Chernila, and dressing adapted from Feed Me Pheobe. While I tried to be specific, don’t get crazy with exact quantities here. Use what you have and what you like. This would easily double or triple for a crowd (just use multiple platters). Whiz the ¼ cup extra virgin olive oil, lemon juice, mustard, and capers in a food processor or blender, or mince the capers and whisk all ingredients together. Place the eggs in a small pot and cover with cold water. Bring to a boil and cook for 9 minutes. Drain and rinse in cold water. When they are cooled a bit, peel and quarter. Preheat the oven to 425F. Cut potatoes into 1” pieces. Toss in olive oil and a bit of salt and pepper. Spread in a single layer on a baking sheet and bake for 20 minutes. While the potatoes are baking, trim the ends off the asparagus, cut the tomatoes in half, cut the radishes in quarters, and look at the pretty snap peas. 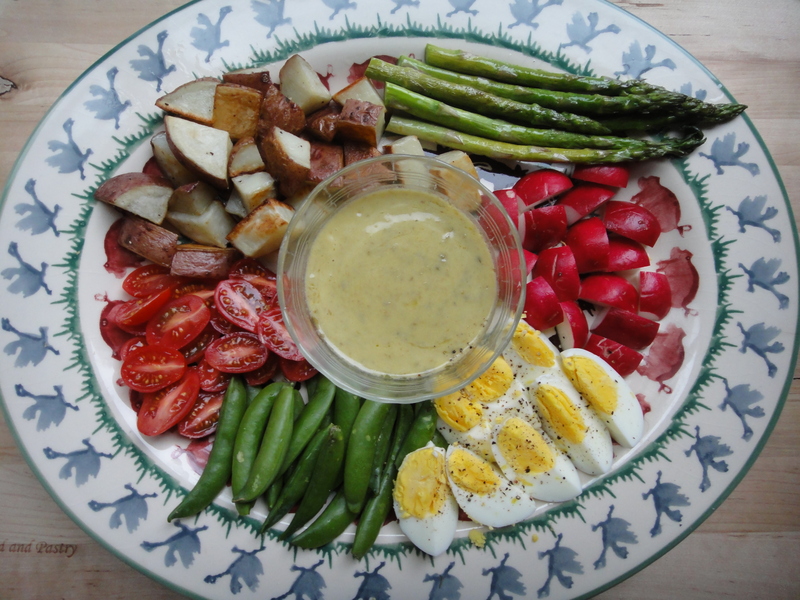 On a large platter arrange the tomatoes, radishes, snap peas, and hard boiled eggs. Season them all with a little salt and pepper. Fill a small bowl with the dressing and place in the center. After 20 minutes take the potatoes out of the oven and move them over to one half of the baking sheet. On the other half put the asparagus and toss in the oil that remains on the pan (or add a teaspoon more if needed). Return the pan to the oven for 5 more minutes. When they are all done let them cool slightly, then add to the platter with the rest of the salad. Dip, and enjoy! This entry was tagged asparagus, caper, lemon, potato, radish, salad, snap pea, spring, vegetarian. Bookmark the permalink. My son has made the Spring Salad and the Sweet Potato Burrito Bowl for us and they are both excellent!! Thanks so much for posting-we will continue to try your recipes!